You will need: 8 1/2″ x 11″ (22 cm x 28 cm) piece of construction paper, buttons, glue, yarn scraps, green pencil, and pen. 1. Fold paper in half (short way) to make card. 2. Arrange buttons on front of card to form flower (or other design), and glue them in place. 3. Draw lines for stems and leaves with pencil, then color. Glue yarn to penciled lines; let dry. 4. Write personal message inside card with pen. About the many hats she wears—and why and when and how. Fit for a king—a blue-ribbon winner! 1. 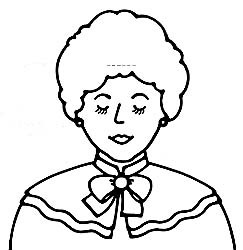 Make copies for each child to color and cut out. Sing Mother’s Day songs while making cards. Older children could list additional things that their mothers do that they appreciate. 2. Prepare program by enlarging cutouts. Mount mother on large poster board, then place on easel. Assign children to memorize verses and put appropriate hat in place before they say their part, or children could wear real hats. 3. Discuss other mothers (grandmothers, great-grandmothers) and responsibilities they might have had in their day or what the children remember about them.